His research deals with understanding the molecular mechanisms of nutrient absorption/interactions and their modulation by other dietary components for providing useful means of developing food based approaches for alleviating micronutrient malnutrition. He is part of the research team that is studying the mechanism of absorption, interactions and bioavailability of iron, zinc and pro-vitamin A carotenoids. He is also involved in characterizing the iron absorption enhancing components from milk, meat, poultry and other traditional plant sources with known Hematinic activity. He specializes in using in vitro approaches to simulate digestion and study the absorption, metabolism, and transepithelial transport of nutrients using cell culture models. 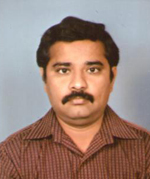 Raghu P, Srinivas PNBS, Nair KM, Reddy GB. Binding and stabilization of Transthyretin by Curcumin (March 2009) Archives of Biochemistry and Biophysics, In press. Sreenivasulu K, Raghu P, Ravinder P and Nair KM. Effect of dietary ligands and food matrices on zinc uptake in caco-2 cells: Implications in assessing zinc bioavailability (2008), Journal of Agr. Food Chem. Vol 56: 10967-10972. B. Satyanarayana, P. Raghu, P. Ravinder, Madhavana K. Nair, Gastric digestion of pea ferritin and modulation of its iron bioavailability by ascorbic and phytic acids inCaco-2 cells (2007) World j. Gastro. Enterol. Vol. 13: 2083-2088. P. Raghu and Mark L. Failla, Assessment of beta-carotene and lutein bioavailability from drumstick leaves using coupled in vitro Digestion Caco-2 cell model (2007) J. of Medicinal Food Vol10: 252-257. Raghu P, Sudip G, Hasib A, Soundarya M, Aruna B and Nasreen Z. Ehetesham (2004), Dimerization of human recombinant resistin involves covalent and non-covalent interactions, Biochemical Biophysical Research Communications, Vol 2: 47-53. P. Raghu, P. Ravinder and B. Sivakumar (2003), A new method for purification of Human plasma Retinol Binding Protein and Transthyretin: Biotechnology and Applied Biochemistry, Vol: 38, pp: 19-24. P. Raghu, G. Bhanuprakash Reddy and B. Sivakumar (2002) 2,4-Dinitriphenol Inhibits Transthyretin Amyloid fibril formation through Tetramer Stabilization: Archives of Biochemistry and Biophysics, Vol: 400, pp: 43-47.